I woke up this morning knowing something was really wrong. One of my eyes seemed all cloudy and blurry. I rubbed it. I washed my face. I tried going downstairs to see if a change of scenery would help. I tried blinking multiple times. I waited ten minutes thinking maybe I just needed to wake up more or something. Nothing. It was still all blurry and cloudy. I started getting concerned… thinking through everything I’d done the day before, everything I’d eaten, how I’d slept. And then it hit me: had I taken out both s last night? I was sure I had, but just to rule out every possibility, I stuck my finger in the eye that wasn’t blurry and starting swiping it to see if my was still there. Um, yup. It totally was. I felt pretty dumb at this point. I mean, here I was running through all these scenarios of losing my eyesight and the problem was incredibly simple: I had a in one eye and didn’t have a in the other eye. This threw my vision out of whack and made one eye seem very, very blurry. As I went about my morning, I not only felt relieved, but I also began thinking about how a change of perspective can change everything. Sometimes, it’s not exactly what meets the eye (pun fully intended). For instance, not too long ago, I got a comment from a reader who was very upset that I had posted a picture of a Starbucks cup. She was upset that I’d spend so much money buying coffee when it’s so much cheaper to make it yourself. She went so far as to say she wasn’t sure if she could keep reading my blog because it seemed hypocritical for me to blog about frugal living and drink Starbucks at the same time. While I completely understand that a picture of a Starbucks drink on December212012.info might seem like a contradiction, it’s not always what it seems at first glance. In the case of the Starbucks cup, it was a coffee I’d bought at the airport, because you can’t bring homemade coffee through security (I wish!). In addition, it was only plain coffee, not some fancy drink (coffee is actually one of the cheapest drinks you can buy at the airport). Plus, in this instance, the conference I was traveling to speak at, had given me a generous food allowance for everyday and was reimbursing me for all food expenses. And not only that, but I actually used a Starbucks gift card I’d earned from Swagbucks to pay for my coffee. So you see, it’s not always what meets the eye. A change of perspective can make a big difference. Now, I don’t say all of this because I feel the need to defend myself for occasionally drinking Starbucks coffee. I share this because it was a good lesson for me: I can be quick to jump to conclusions or judge based upon the appearance of what something seems when I don’t know all of the facts. In the future, I want to remember that it’s not always what it seems. Before I criticize someone or get frustrated or worked up over something, I want to first make sure I know all the facts. I’m so sorry you went through such awful eye pain. 🙁 I hope it’s all cleared up now? Did you ever figure out the issue? I have an eye infection that just won’t go away. It’s been a year/year and a half. How awful! I have training in alternative medicine and I would recommend Warrior from Heritage Essential Oils.com. Order some empty capsules and take 5 drops in a capsule one time daily for 10 days. Warrior will knock out infections that nothing prescription can touch. Hope this helps. Love this post. I wear s too and while I’ve never forgotten to take one out, I have tried to put two in the same eye. I had to laugh that someone complained about you drinking a Starbuck’s coffee. I remember that post because when I saw the photo of the coffee cup I felt better about the fact that I occasionally have Starbuck’s, which I really, really love. It’s okay once in a while, especially if you’re using a gift card! Absolutely! Everyone needs a treat once in a while. However, I do understand the poster’s point. One thing you’ll notice about money-saving blogs is that once the bloggers become successful, their shopping habits often change, sometimes drastically. So while posting deals about inexpensive processed foods, their kitchens are full of high-end organic foods and appliances that do not seem to fit into the budget they tout or the lifestyle they otherwise depict. It’s not so much hypocrisy as a change in their personal circumstances without a corresponding change in blog content or in the makeup of their audience, but it can be jarring to readers. Erin: What I love about the readership here is that there is so much diversity… and that everyone does such a great job of celebrating and encouraging one another. Not all of us can afford to eat organic, but are all seeking to do the best we can with the time and resources that we have. Some here are in the barely-scraping-by-just-happy-to-have-some-kind-of-food-to-put-on-the-table season and others are able to spend more on groceries, but it’s a beautiful thing to see so much celebration and encouragement going on. I love how everyone comes together to inspire, motivate, and encourage each other on our own respective journeys! Crystal, I love this comment! I consider myself to be frugal, but by the standards of someone scraping by I am not at all. I think you have a good balance. I am sure it is hard to have a money saving blog that appeals to many income levels and lifestyle differences. Bummer that you can’t have a simple coffee without being judged. You deserve the coffee if you want it, with or without swag bucks or whatever! Heaven help us all if a blogger as genuine and generous as you are has to hide the fact that she enjoys a Starbucks now and then. Me thinks you are too young for ‘senior moments’. 🙂 Hugs! I am known by my friends to be very frugal, but I realize I spend money on things other people wouldn’t and that we all do that, to a degree. For example, I spent money on car washes because I didn’t have good health, at a certain time in my life. I love to go on vacations and out to eat. We all have things we “scrimp” on and things we splurge on, to a degree. I love your blog! I think that’s so true. I probably spend money on some things that others wouldn’t and visa versa. That’s the beauty of us all being unique and then being able to learn from and be inspired by others! Crystal you can get all the Starbucks you want – in my book, you save and you are wise with your money SO THAT you can spend it in the places that matter to you, whether it’s being generous or a purchase you really value. I think this hits to the heart of what I view as being intentional with finances. You don’t make short-term sacrifices and live on a strict budget just for pinching pennies’ sake, but so you can get to a place where you have some breathing room in your budget so you can give generously and also enjoy budgeting splurges on occasion. I am so glad I am not the “onlycrazy women”. LOL Thank you for being real and honest. Saving in one area, allows me to spend in another area I wouldn’t be able to, but find joy in doing. I totally get what you mean about jumping to the worst case scenario! I do the same thing… My 8 month old has eczema and I’m so nervous about severe food allergies! I need to take it one step at a time and stop creating a diagnosis based on nerves. As for you drinking Starbucks….really? Can you not enjoy a cup? That’s just ridiculous! Um, I SO get this! Just an encouraging word on the eczema front… My daughter’s was terrible from the time she was 6 months. I had a very “well-intentioned” woman say to me once, “I’m sorry she has eczema; I know you really want her to be pretty.” WHAT!!?? Anyway…She is 6 now. Her skin is definitely still sensitive to scented things especially, but there is no more chronic eczema. The way I always looked at it… There are many childhood diseases far worse than eczema. If that was the worst we ever dealt with, we were pretty blessed. One word of advice…When people held her, I always made sure her blanket was underneath her. Laundry detergent was a big trigger for her eczema. I could be using unscented everything at home, but then Aunt Susie would hold her beside her Downy soaked sweater and baby girl’s eczema would flare back up. Which detergent did you use? Thanks for responding! We use either Ecos or Seventh Generation free & clear. I’ve even been able to use the Ecos scented types (magnolia &/or lavender) as time has gone on which is more cost effective since Costco & Sam’s carry them. Otherwise, we usually purchase both brands at Whole Foods or Seventh Generation at Target. We purchased Ecos in the Denver area at Babies R Us while on vacation (while kind of spend) I’m sure other stores carry one or both. Oh my goodness, so rude! You’re certainly right that we’ll be lucky if it’s the worst. Which laundry detergent did you use? Thanks so much for your comment! I was able to use any unscented detergent and only vinegar as fabric softener. (If you’ve never used vinegar in your laundry, don’t worry, it doesn’t leave a smell.) I started with the baby detergents but hated the price. So I started experimenting with all the “free” or “clear” detergents, and they were all ok. Hang in there with the eczema! My little one suffered for months until we actually knew she had eczema! My encouragement is to get as natural and basic as you can in laundry soap, body soap, and lotions. I started making my own detergent, using natual soaps and lotions, tea tree oil, and cutting back on dairy milk. Environment is what gets my little one. She has major issues with pollen. Our move from Texas to Georgia has helped knock out many allergens, awhile at the same time we are finding new ones. It is a learning process…painful at times, but manageable. Hang in there!! My 15 month-old has eczema. He was tested for food allergies – all of the main ones anyway (eggs, dairy, wheat, shellfish, tree nuts). He came back “clean” so we’ve not figured out what’s causing his eczema yet. I think it’s environmental allergies (his dad has pollen issues). I say this to let you know that it is entirely possible it’s not a food allergy that’s causing it. My son was one that was probably what you consider worst case scenario with his eczema. He was broken out all over. We found out he is allergic to wheat,milk, eggs, and nuts. At first it was rough. Now he is doing great. His skin is clear and he is starting to outgrow some of his allergies. My allergist told us that 80 percent of kids outgrow wheat milk and egg allergies by the time they are 3. In the meantime I have learned a lot. I am now more aware of those with allergies and we eat healthier now. Have you tried soap nuts? Maybe that would help. My son had eczema as well and we used all free and clear and I double rinsed it. I wish i had known about the soap nuts then. I also didn’t use any harsh chemicals for cleaning. It helped. He’s six now and the skin thing is better. He does have food allergies as well. I know that seems intimidating, but if it ends up being your future you will figure it out! It’s not as bad as it seems. I’ve never heard of soap nuts! We use the All free and clear…..never thought of double rinsing. Should I try that? Thank you for commenting! It’s worth a try. Also I’m guessing you don’t do fabric softener, but if you do I’d stop that too. And non harsh soap for bath time…the all natural ones. You might need to experiment a bit. Good luck! I fully understand those “senior moments”! When my son was a yr or 2 yrs old; we lived in a very small town of less than 600 people. I drove to the grocery store 2 1\2 blocks away with him. We were in the store less than an hr and then walked home. Later when I went to get in my car I was so sure that someone had stolen it. Then it dawned on me that I had driven to the store and then walked home. And surprise! There was my car in the store parking lot! Oh my goodness, Teri! That sounds just like something I would totally do! That’s right… making assumptions often leads to no good! I use my Bing rewards to pay for my occasional Starbucks – it’s like bing is my one online activity that I set aside as being for ME, it’s my “treat” fund. It’s nice to have that and not feel guilty about it. I can’t really call myself a frugal person, but I would think that many frugal people are frugal so that they can spend without any worries when they want to! Being frugal doesn’t mean you have to be miserable, boring, and restricting yourself from everything. I am pretty sure that there are many VERY wealthy people out there who are frugal – my uncle is one of them! His house is cold because he doesn’t like using the heat but his house is beautiful! He doesn’t waste money and hunts for the best prices but he buys quality items and enjoys life – quality items, good restaurants and travel. You are a frugal person and always will be. Frugal is more than just spending as little money as possible all the time. Such truth! Thank you for sharing this great perspective. I get it! I walked into Kroger one morning and the signs all looked blurry and distorted. I thought I was losing my eyesight – right there in the produce section. I had driven to Kroger without any problem and everything seemed fine until I walked into the store. Thankfully I had lost a . I’m not sure how that happened, but it did. And last Saturday – well, I might have lost a part of my brain. I was so busy double checking my receipt to make sure all my e-coupons were deducted, my free items rang up correctly, my gift cards were activated and my fuel points were accurate . . . that I walked out of the store with the empty cart instead of switching to the one with my groceries!! Some days you just have to laugh at yourself. Learning to laugh at yourself is SO very important… especially when you’re someone like me who makes lots of crazy mistakes. I would so be the woman walking out without my groceries. Know that you are not alone. And thank you for making me feel less alone! I’m glad you don’t have an eye infection. Those are the worst. Thank you for posting about things like this. Knowing I’m not the only one who catastrophizes things makes me feel a little less ridiculous. So sorry you have to deal with negative comments about your choices. I don’t quite understand why someone would take time out of their day to criticize and put your decisions down. You spend so much time writing things that make me feel more grateful, more thankful, and more comfortable with myself. Frugal or not, if you (or anyone else) wants to drink a fancy, expensive coffee drink they should be able to do so without negativity and judgement…and when they realize they could be getting great coffee for less you can be there to help them save their money!!! I always try to remember that a seemingly negative comment probably comes from a hurt place. Maybe the person is really struggling financially and feeling very desperate and that’s where it’s coming from, or they have other hard things in their life they are dealing with. In the same way that it’s not always what it seems when a commentor jumps to conclusions and criticizes our family, I know that I want to be careful not to jump to conclusions about a commentor… because I don’t know the backstory on where they are at and what struggles and hardships they are facing. I don’t think it matters whether you had a swagbucks giftcard or per diem or anything with the starbucks. If you want a dang starbucks go buy yourself one. A once in a blue moon starbucks (even if you bought a grande caramel whatever) isn’t going to make you a hypocrite. It isn’t like you went out and bought a pair of Jimmy Choos on a credit card while preaching about saving money. It was a coffee. It makes you a perfect human who needs to treat themselves once in a while. As a mom, business woman, wife, and your own person if you want a starbucks get one and enjoy it to the very last sip. I have a friend who went through several months of incredibly expensive testing (all the way up to an MRI) because of severe vision problems she was experiencing. After seeing all sorts of specialists, her primary care asked her if she had recently gotten new glasses or s. She had. She went back to the optometrist and they had given her the wrong prescription. lesson learned about looking for the simplest answer. Even if it’s not the answer, it’s a great place to start! Tsh Oxenreider talks about a reverse competition (or something like that). It basically means that it’s not a race to see who has the least stuff or who is the most frugal. It’s about doing your best as a family. If it makes you feel better, I woke up with BOTH s still in this morning. And I am usually really conscientious about taking them out. Love the insight about the Starbucks – it’s all about perspective! For the record, I feel like you as a blogger have set a good example of being extremely frugal but also enjoying the pleasures of life. You’ve written posts about splurging on buying a candle for yourself, but you’ve also shared links to coupons for candles and DIY candles. You’ve written posts about getting Subway for dinner on a really busy day, but you’ve also shared tons of grocery lists and ideas for cheap homemade dinners. You’ve written posts that have exposed you drinking Starbucks, but you’ve also written posts on how to make coffee at home and when there are great deals happening at Starbucks. It’s not hypocrisy – it’s called BALANCE. I had to laugh out loud at this post, because the very same thing happened to me once! When I realized what I had done I just had to shake my head. What an idiot I thought I was, but, you know, we get busy with kids and everything else going on. I’m sure I was interrupted during the process of taking out my s. Now my daughter is all grown and out on her own so if this happened to me now it would really be a senior moment! “make sure I know all the facts before reacting – Things are always not what they seem”. Thank you for the reminder and for being so honest. I do jump to the worst case scenario too and it’s good to know that I’m not the only one. In the past I used to read your blog and never commented. I am doing so now after your post on how unkind people and critical people were. So thank you for being courageous to expose your life and sharing and being honest so that others know that they are sometimes going through something similar too. I enjoy your blog. Thanks again. You have a right to spend money on what you want. It’s your money. While back, I had enough reward points (huggies) to get either a package of diapers or a Starbucks gift card. Although my baby needed diapers and free is always great, I chose Starbucks because her mama needed it more! Being frugal is one thing but we should be able to enjoy life and splurge when we can. Sooooo, you bite your nails AND you drink starbucks coffee? Noooo!! I can’t believe it. I kid, I kid. I appreciated the mention of not jumping to conclusions. So often, we have no idea whats really going on behind choices of any sort. In this case, wise spending choices on a daily basis allow for occasional outside enjoyment for anyone. Everyone is at a different place in their own financial journey. Saving money in other areas frees up funds in others. All this coffee talk has me looking forward to my morning cup. Love your content and your recent personal posts. Thanks. Your blog is about being frugal, but my definition of frugality means that your are a good steward. It doesn’t mean denying myself of things, it means not being mindless about money and “choosing” where to spend. As for us we drive used cars, have a small house, use coupons and buy and alter Goodwill clothing….but we eat out at least once a week…and we take marvelous vacations. The best money I have ever spent was when I got LASIK. I went from 20/1000 (yes that is one THOUSAND) to 20/15 in one eye and 20/20 in another. My husband’s uncle has some nice properties that he used to let us use for free once a year. If you looked at pictures from our vacations you would assume we spent a lot on them when most of the time it only cost us some gas and food. I am sure some that didn’t know us well didn’t understand why we drove old vehicles and lived in a small apartment. Most of the time we don’t see the whole picture. Haha! I’ve done the s thing too! Or left them both on and woke up with perfect vision and thought some miracle happened overnight. I totally agree with you about getting all the facts first. Better to be slow to speak. I would recommend Lasik because I think it was the best money I ever spent in my life. But, then you would probably get more hate mail. 😉 Just joking. I can’t believe anyone would be criticized for $5 coffee. And to take the time to criticize them is just mind-blowing! Even if you didn’t use swagbucks, I think it would be totally acceptable. The negative comment about a cup of coffee does not make anyone’s heart sing. If you are near sighted and in your early 40s…you might be able to do Lasik in only your dominant eye and be just fine like I did. And who cares that you bought a coffee at Starbucks…even if its a full priced Venti hand crafted drink That’s part of saving…enjoying a splurge when you want because you’ve saved on so much more! Let’s just get real! You can’t always be at home & make your own coffee! You deserve to treat yourself well! my hubby who is quiting smoking and as such as starting giving me some of his cigarette money to use on myself so after a couple of weeks of saving this week i am going on a coffee “date” with some friends. – i am the only female in our house – even our dog is a boy, i need some girl time lol – besides it’s been over a year! usually i just make myself some chocolate muffins and have one of those instant cappucinos but there is something extra special about a coffee made by someone else. i don’t think msm would want anyone to never treat themselves again. I dont think you should justify any thing you do! Kind of irritates me that anyone would make a comment like that! I feel like people who take the time to basically tell someone else their wrong may not be looking at their own life! I love your blog, thanks for being so real! I commend you for your poise while basically being in a fishbowl…you’re subject to (but not bound to) the scrutiny of so many people! Dealing with that takes a level of security and maturity in your identity in Christ to discern and choose those things that we have complete liberty in Christ to choose (and enjoy!) without justification. My God be praised for His workmanship in you. Glad your eyes are ok Crystal. Have you ever consider lasik surgery? I did it like 16 years ago and still so happy that I listened to my mom, who basically pushed me to do it. It was funny to read about your reader who wants to stop reading your blog because you are drinking Starbucks. 🙂 I used to hate Starbucks when we were paying off my ex husband debts and he kept going there every day. But then I changed my mind, as long as someone doesn’t turn it into everyday obsession. Plus now days there are so many ways to earn gift cards or free drinks, so anyone can afford a treat once a while. Crystal, I have learned SO much from your blog over the years. Through your blog, I have learned ways to save money, enjoy and appreciate what I have more, and I learned about a guy named Dave Ramsey. I really don’t think you need to justify anything, but I also know that if someone has been following your blog long enough, they know that you follow many of Dave Ramsey’s principles and that means you have different “envelopes” for different purposes. Even if you chose to have a Starbuck’s envelope, that’s your choice. In fact, I sometimes use my personal cash to meet a friend at Starbucks because it allows me a mom’s night out while only spending a few dollars. So it can actually be a VERY frugal treat. As far as the other commenter to said that some frugal blogs start spending more extravagantly once they make more money I say if you can afford organic food now, but couldn’t before, wouldn’t you start buying organic and feed your family better? You have posted about your early days and your struggles and I’m sure Starbucks wasn’t in the picture then, but now you can afford it without sacrificing your principles and what you have always valued. As far as the s go, I can’t tell you the number of times I have looked everywhere for the car keys that I was holding in my hands or have diagnosed myself with some rare tropical disease when I may have had a cold. Gotta love a busy brain sometimes! Keep doing what you do because you’ve helped so many people like me become more intentional with our finances and our lives. Thank you! Lol! I use bloglovin to read blogs, and it cuts blog titles off at a certain number of characters. So this one was called ‘A Crazy Eye Episode and Why I Sometimes Drink.’ 🙂 Which I automatically knew wasn’t the entire title but it just made me laugh. WOW!!! Such a great lesson! You are AMAZING and your story is so relatable! You are seriously my idol! Only you can take such a simple little silly thing and make a monumental life lesson out of it! THank you so so much for being so wonderful! I LOVE your e-book about How To Make Money Blogging! You are so inspirational and I love how you are willing to help the newer bloggers (like myself), lol! It is because of you that I started my blog on WordPress.org and that I bought my domain at GoDaddy. SO thank you for everything! I love your life lesson. Don’t judge, you may not know all of the details. Thanks for sharing that! I so relate as a busy Mom! Makes me reconsider serious blogging though – with all you gotta put up with! It all comes down to being intentional. When you are, you can enjoy treats and/or splurge in things that someone else would consider to be wasteful, because it’s your life and you choose (wisely) to spend money in a way that serves your values and purpose in life. When my mother skipped the state school (so convenient in location and cheap) to sign me at a private Catholic school (critics everywhere commenting on the huge expense!) she made the best decision ever. You just cannot please everybody. Whether it’s coffee or life-changing decisions. I haven’t read all the comments yet, but you are anything BUT hypocritical, and here is proof: You are constantly reminding us that we can’t be frugal 100% of the time or we will reach burn-out. You often encourage us (like Jesse does to you, wisely so) that it’s OK and even healthy and necessary to splurge once in a while. I like it that you so kindly share your non-frequent splurges with us so we can get a glimpse into what makes you smile…although I think we all already knew that Starbucks does that. 🙂 Thanks for all the encouragement, Crystal, and for not hiding anything on your blog, but for showing us the entire (pretty) picture of your life. Hmmm, the sharing and other reader scenarios make me “been there taken some funny steps myself” smile. We have stayed in a new, 5000 sq. ft. corner beachfront property ~ family guestroom was lovely but not as lovely as the time spent together. We vacationed for a week in a grand, new, Victorian house with a cement pond(Beverly Hillbillies lingo) in a high end neighborhood, dog and house sitting. Disney? Back then when hotels in park were out of this world and off property just a little less, we learned of new hotels just a little further away that were offering rooms at dirt cheap by booking months in advance…and I mean pocket change in comparison. Tickets? Work discount and vacation savings gifting. We ate in hotel(local grocery/picnic style) and/or in park(breakfast brunch for the biggie and quick bite later). And there have been window and other home treatments that would rival those of bespoke ~ they have been, grew up in the home of a seamstress that trickled down to the fruit of my hands and a wonderful sewing machine that was a gift. Clothes? We’ve been known to wear high-end clothes…thrift store variety(some still bearing department store tags). Furniture…etc.? Gifts, refinished, etc. A borough manager once asked who was behind our landscaping(what a pleasant surprise how well it grew)…newbies at it, us. A really nice above-ground pool…found it end of season for a steal because the person originally buying it on hold didn’t complete the sale. I grew up in family that immigrated to this country and navigated the Great Depression…you know the scenario ~ wash/reuse/wash/reuse aluminum foil, wringer wash laundry and line dry outside summer/inside winter, extend fabric softener by diluting 50/50 and then some with water, etc., garden/can/freeze, garden/lawn/house/ALL chores and grades without $$, (and the memory of eating fast food ONCE when growing up). Parents traveled to many eastern states ~ we NEVER ate other than local grocer/roadside fruit/veggie buys/picnic style(remember picnic areas used to be along many highways?). We have been told, oft flavored as if it were a bad thing, that God has really blessed us…and indeed, He has even in the very lean times of health and financial downturns and moves that happened because of choices of others. While believers are to avoid appearance of evil as stewards of all in our charge, we also can remember that comparisons can fail the best of us(even in comparing motives behind perspectives). Thankfully, God is the only One that can and does rightly judge the heart. Oh…just recalled how my dad on those vacations, especially beachfront, would actually drive along an area to stop in MANY hotels/motels asking of their offerings/prices to settle for what was right for his wallet. Remember one motel that included brick bbq eating area…and we and the owners and some other vacationers enjoyed meals and good conversation. Meals…hmmm, my mother brought along an electric skillet and fried potatoes in a can she bought from a local grocer on sale. Starbucks? ~ that’s chump change splurging. Seriously. Wondering if some folks give the word “frugal” a negative connotation. Love reading these true-to-life moments! Your return to personal blogging is such a gift to us! A definition that has been helpful to me recently in evaluating our “intensity” of frugal living is this: living an uncluttered life. It’s actually helping to reevaluate the entirety of our lives, and how we can live simply. We’re aiming to lose the clutter: physical stuff, schedule (busy, busy, busy), relational (letting conflict simmer), financial (debts, etc), and many more, so that at any moment, our lives our uncluttered to the degree that we’re always available to respond to God’s invitation to serve Him by blessing others. Good job Crystal!!!!! I too jump to conclusions waaaay too much. Thanks for the reminder not to judge. For some reason this characteristic is ingrained in me and I’ve really been trying to weed it out. Just the other day I thought someone was being racist towards me, and I did this huge status posting about how Christians should not be racist. Then the next day I woke up realizing that I didn’t know that person very well, and they could have been having a bad day, feeling sick or a million other things going on. Opps. We all make mistakes. Thanks for be open to sharing yours! I usually wear glasses, but have s for convenience. I wear them when I want to wear sunglasses or I’m going swimming, etc…. I have actually put in my s and then put on my glasses. Let me just say that it makes it nearly impossible to see. Glad to read that I’m not the only one who is absentminded sometimes! Omgosh! You made me laugh so hard. Thank you for that. Really glad it turned out to be nothing serious. After several years of stress from not getting by (even after every frugal measure possible shy of giving up toilet paper! ), God had blessed my husband’s and my business so that we actually have breathing room in our budget. It feels so good to be able to buy myself a little maple candy treat or some other little splurge when I go grocery shopping now (with coupons, the sales flyer, and a meal plan grocery list in hand) and not have a heart attack over it. But no Starbucks for me–I hate coffee! Haha! Wow, all of us have lapses like that once in a while. One of my favorite sayings: It’s hard to walk in someone else’s shoes. Your reader did not know the whole story. She had no idea what was behind your photo. But really, do you have to justify if you just wanted to indulge? A cup of coffee is not such a big thing. If it makes you happy, you deserve that cup no matter what the situation. All of us owe it to ourselves to do something for us once in a while. We should not judge someone else’s actions, especially if they don’t hurt anyone else. Crystal, If we can’t treat ourselves every once in awhile I think it makes life harder. I am at a point in my life where things are easier. But have been at the point where I wondered how I was going to feed myself. The one thing that always nagged at me a little was I was so frugal and my friends would get to go out and have lunch/dinner and I was eating leftovers and staying home. Then I got the idea that for occasions like my birthday or Christmas I would ask for some gift cards for special treats. Dinner out, Starbucks a massage. I really didn’t need more stuff but I needed to feel a little indulgent at times to keep my spirits up. My Mom loved doing that because she hated shopping for gifts. So that is what I got for several years. We were both happy. I still love nothing more then a great cheap find, coupon or extra special deal. It makes me happy to see how much I save every week on my grocery receipt. I think once you have lived your life that way you don’t normally change your way of thinking all that much. Or at least I didn’t. I know how it is when it comes to your eyes. Suffering from fluoroquinolone toxicity syndrome, every morning I wake up, and my eyesight is getting worse and worse. It is very restricting and can be very scary. Doctors cannot find anything wrong. But I try to trust that God knows what He is doing. It definitely puts your perspective in the right place! I’m so sorry you’re going through this, and I can understand that it must be scary. I’m praying and trusting that your sight will be restored. I am very frugal, and my husband is not. When we got married and took a personality test, the advice the minister gave us was that my husband needed to learn frugality from me, and I needed to learn to enjoy money and splurge on myself at times. 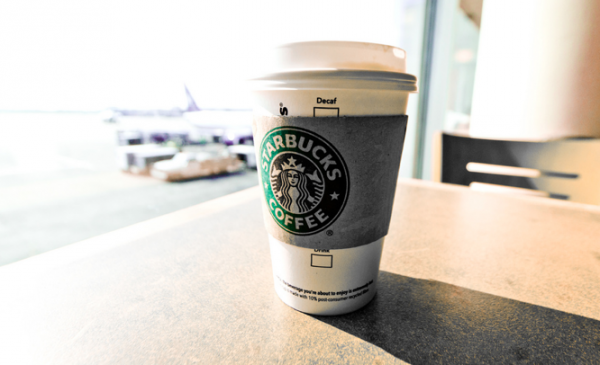 Enjoy a cup of Starbucks from time to time, you’ve earned it! Hahahahaha we discovered that my husband and I are the same way as well! We have developed a balance. I’m also the frugal one, which my hubby appreciates, but he found a great way to help me spend some too. For our anniversary, he got me a Starbucks gift card. I love Starbucks but he knows I can’t bring myself to spend that much on a cup of coffee. The money for the card came from our gift budget so it would have been spent on something anyway. This way I can treat myself guilt-free….and appreciate him every time I do so! I love your blogs and if I saw you with a Starbucks cup I would have automatically thought you got it with a gift card or something! And you did! When my hubby’s company is paying for his meals he splurges too! You go girl! You deserve it even if you did buy it with your own money! Thanks for the lesson on not to judge…I needed that! I think there needs to be balance in life even when being frugal in order to keep working towards the greater goal. Once a week I get coffee as I feel I would like and do need that treat once in a while. My husband has a weekly sum he uses for coffee and such for himself and his team, (goes with the law enforcement territory). We do live very frugally but this is how we gain the momentum to continue to work toward the goal of paying off all debt…..2 years left!!! Good grief, I can’t believe someone thought it was their place to criticize you for a Starbucks coffee! I appreciate your blog and everything you write to encourage us! I just wish everyone would spend time building each other up instead of tearing each other down! Totally agree Diana. Thank you Crystal for all you do to encourage us. Starbucks and coffee shops are one of my favorite ways to spend my small amount of blow money. The best part of blow money is *I* get to pick how I want to spend it! And, now I’m craving a frapuccino. Sounds like a delicious luxury! No one, not even a frugal blogger, should feel compelled to justify every purchase to a stranger. Everyone has a different budget and after growing a hugely successful business while homeschooling your kids, you deserve fancy expensive coffee with or without swag bucks points. I’d just like to thumbs up this comment a thousand times. …and what I have found is that I NEVER have all of the facts. I may know some of the facts, which leads me to a certain conclusion, only to find out a little here or there which changes the entire situation. Pro 18:17 “The one who states his case first seems right, until the other comes and examines him.” It is because of this that I am learning not to be so strongly opinionated. Lol! I’m a gold star member at Starbucks and have never spent a dime there! I do surveys thru e rewards and earn Starbucks gift cards and I tunes for my kids! That is my way of splurging. Plus I only drink coffee and hot tea. Only get the blended drinks when there is a special. That’s when I take my teens out for a treat and then I earn extra stars for that visit which gets me more discounts! I am thinking about corrective surgery for my eyes in the near future. What about you? Just as a comment from a former Starbucks employee.. I want you to know that by choosing to drink from Starbucks and not say..Mc Donalds just to get something cheaper.. can be commendable. At Starbucks we were paid a generous wage, received health care even at part time, were given bonuses for our knowledge, received help with school, etc. Also Starbucks matched every dime I earned to various programs like the Make A Wish Foundation. Up to the tune of thousands of dollars, no questions asked (well, other than a proof of donation). We also donated all unsold coffee/goods/pastries to homeless shelters in the area. So yes, the drink is more expensive… but there is a reason for that. Hmm, that’s interesting. I’m personally wiling to spend more to support a company I feel treats employees the right way. It’s the main reason I’d do a costco membership over a Sams club. Costco treats employees so much better with wages and benefits from what I understand. That is great info! Thanks for sharing. You’re welcome. It really bothers me that Starbucks get such a bad rap for the expense of it’s drinks. Everyone that shops there is aware of the cost so it is their choice to spend it or not. Every one of my co workers was happy to be there every day because of how great we were treated. That translated into the customers having a great experience as well. And I can also say that Starbucks is very clean and has very high standards of health. Can’t say that about a lot of other restaurants. Great comments about the starbucks. I used to think similar things- like I was donating to a ministry and the leader showed up in a Lexus! At first I thought, wow, if she can afford a Lexus, why am I donating dinner for her students. Then I thought, I do not know how she got that car, and figured someone probably gave it to her. Anyway, I really discovered that it is so much more about my attitude and obeying God’s prompting in my life, to give and live as He wants me to. Love it! I have totally done the exact same thing with my s! Very freaky! I too adore Starbucks – I don’t drink coffee, only tea… I use my Swagbucks and mPoints rewards to “fund” my addiction! It is my little splurge once or twice a week! Gee – one definitely shouldn’t judge unless one has all the facts. Besides, even if you paid for the coffee an occasional treat isn’t the end of the world. Just be careful about those s – you wouldn’t want to get an infection leaving them in too long. Don’t worry, I once put both s in one eye and wore them that way the whole day- I couldn’t figure out what was going on with my vision either! When I first started reading this it was very familiar. I had the same thing happen but I don’t wear s & I had to go to the hospital. When the ophthalmologist looked in my eye he asked if MS runs in my family. I have optic neuritis & many times this is how MS is disgnosed. I was in the hospital for 9 days on IV steroids & my vision has finally improved several years later. Still cloudy but I am more used to it. Never was diagnosed with M S after all of my testing but still worry about it occasionally. Mostly I enjoy seeing so much beauty & color around me that I soak it up in case it decides to go away again. That was a good one.=) Thanks for the reminder. It is funny how us readers (or maybe just me) can judge someone’s life through a blog when really, we only get to see what you let us see and it’s honestly the same way in real life with the people we meet. And I’m the same way. Last major sickness I had lasted forever AND I was pregnant! It seriously got to the point where I was googling alot and had convinced myself I would never be able to smell or taste anything again. It’s awful but those times are GREAT reminders to be thankful each and every day for our ability to see and taste and smell, etc. Don’t apologize or explain your Starbucks! Crystal, you should be able to drink whatever coffee you want without the fear of being criticized – but I realize this IS the internet, goodness knows what rubs people the wrong way (: I coupon and am very frugal. When I do indulge and get some nice coffee, I never feel bad about it! One of my friends from college is the most frugal person I know and she frequents Starbucks. There is nothing wrong with treating yourself to Starbucks if it is something you budget for and enjoy! Just as a reminder… while the reader is correct that coffee brewed at home can be cheaper, remember these few points specifically about Starbucks. 1. When you purchase a bag of Starbucks beans in the grocery store (NOT the SBUX store), you can take that empty bag to a Starbucks store and exchange it for a free tall cup of coffee. 2. And if you stay at the Starbucks drinking your free cup of coffee, you can go back to the counter for a free refill with the scan of a registered Starbucks card. Numerous times. 3. Lastly, how many times has the reader been able to obtain free Starbucks drinks, coupons, deals, etc. by having read December212012.info? Just asking. So not every Starbucks cup that exists is due to flagrant consumerism. However, mine mostly are. And I’m ok with that. Because I stay home with my kids, take them on free outings, save drastically on groceries, and read often on how to maintain a Godly home… thanks to Crystal and the December212012.info crew. Hi Crystal! I just had to comment after I read this post and say, “Hey I totally relate!” Except for with me once I tried to take a out that I had already removed. Something must have distracted me in between taking them out or something! 🙂 We all have those days and moments! Keep up the great posts! We love your blog! Glad your eyes are okay. Jeeeesh, who knew there could be so much drama over a cup of coffee! You don’t have to rationalize your coffee habits to us! Your blog sister…rock on! As I see it, being frugal 90% of the time allows me to enjoy money the other 10% of the time. When I’m abroad I always drink Starbucks, because we don’t have it here. I am REALLY glad I don’t get the emails you get. Upset you’re drinking Starbucks? Wow. You’re a very patient woman. I appreciate how kind you are to your tribe Crystal…and I’m glad you’re not going blind. Hi, Crystal! I am so happy to know your eye is okay! I’m a bit of a worse case scenario gal, too. I’m trying to be more positive, but some situations get the best of me. I very much appreciate your reminder about not being judgmental. It is something I try to remind myself when I feel the need to question why people do what they do. Even in such simple simple situations…like a person crossing the street too slowly when we are in a hurry to get to our destination. It hit me one day that I have no idea why people walk slowly. Perhaps they are recovering from surgery, or are having problems and thinking about them, not realizing they are walking slowly. I have no right to judge them. Besides, if I’d made it out the door a little earlier I would not have even noticed they are slow! So if I must be frustrated, it should be with myself. This is so funny to me! I have had optic neuritis before which had resolved sometime ago (but can happen again) and one morning after I put my first in my eye was even blurrier than normal. I couldn’t understand what happened after I took my in and out several times I got scared that I had optic neuritis again until I realized my vision was better without the in that eye I realized I put 2 s in the same eye. Who does that?! A Mom that needs a nap I say lol. Glad I’m in good company of fellow wearers/Mom super taskers! LOL’ing at your story. Totally something I would do with my s! And you’re totally right about not judging by appearances. You just never know the full story. Don’t fret, you are so normal! I don’t think there is a wearer that hasn’t gone to sleep in lenses! I have and I even have a “system” to help me remember not to…I keep my little lense case OPEN, without the tops on, right by my electric toothbrush so I will see it open and know that my s are still in my eyes. My s are so comfy that I forget I have them in! As far as the Starbucks, we ALL have our little pleasures and we shouldn’t judge. Love this!!! I was like “stop defending yourself woman!!! !” Silly. Oh yes and don’t make salsa then put your s inno matter how many times you wash your hands….. Literally thought my eyeball was going to explode!!!! You have the sweetest outlook on everything! You really inspire me to be a better person. Oh, too funny about the thing. Similarly, I went around for a week (seriously) thinking my eyes had been healed of their poor eyesight. I discovered after a while that I had my in one of my eyes (the dominant one)! I seriously thought I had been miraculously healed! Ha! The way I see it: you save your money on just about everything else, so if you splurge occasionally on a coffee that doesn’t make you deceiving. It makes you human. With all the ways you’ve shared on how you yourself save and are frugal, I don’t think a cup of Starbucks coffee breaks your character. Drink on…! Even if it weren’t at the airport, past security, and on a food allowance or swagbucks giftcard…. And even if it were a venti fancy drink… If you enjoy it, and have the budget for it… Well, enjoy it! People shouldn’t make other people feel guilty for treating themselves. A Starbucks coffee now and again might be what a person needs to recharge their day. It doesn’t mean they are crazy spenders! l what a great analogy. I love your blog. you always give me a reason to smile or giggle. Keep looking through both eyes. While some of us may try to be frugal, I believe God wants to bless His children with some of the “finer” things in life occasionally. Sometimes I wear or carry things that I cannot afford myself, but has been given to me by a friend or family member. It’s like God thanking me for being a good steward. Great post Crystal! Great reminder! Hope God gives you some more expensive coffee! I admire the way you turned that critical email into a good lesson for all of us. I’m not sure I’d have handled it with such dignity! And FWIW, I would’ve assumed your Starbucks, like mine, is usually a gift card purchase too! Disclaimer: Please read until the end. I love ONE thing at Starbucks: French Vanilla Latte (Soy). I’m not an extremely frugal person but Starbucks is expensive. However, I love going there. You are paying for an experience. I’ve tried other types of coffee there and just keep going back to the same thing. I’ve had a latte at other coffee shops and it’s just not the same. I only allow myself to go 2x a month. That’s it because it is expensive. I had to respond because I think it is absolutely utterly ridiculous that you have defend the fact that you had a Starbucks coffee. Yes, you are held to a higher standard because you’ve put yourself out there but come on. It’s the same thing if someone had a healthy eating blog and posted a picture of a doughnut and actually ate one. So what! Yes, people would crucify a person for that. I do the same thing though when I watch beauty videos on You Tube and then find out a beauty guru I’ve been following had plastic surgery or something. I become so judgmental about it. Why do we do that? Also, people can say it all they want but you can not create the Starbucks coffees at home! It’s not possible because Starbucks is an experience, whether you go in or through the drive thru. It’s the same when you eat out. When I go to a sit down dinner, you bet your bottom dollar that I’m going to a place that I can have someone bring my food to me. Yeah baby, that’s the ticket. Why do feel the need to explain yourself? So you run a frugal living site, I am very frugal myself, but you are allowed to live your life how you wish. Every person, especially frugalits like us, enjoys that treat in their lives. Otherwise what’s the point? You work hard…. enjoy that cup of coffee no matter where you got it or how you paid for it. I don’t believe somebody has the right to criticize somebody else over coffee. I know that this is not true in your case, but for some people, that one fancy cup of coffee each morning? That’s it. That’s all they get. They have so much going wrong in their life, so much stress, so many problems, that their single, sole source of stress relief is one Starbucks coffee each weekday morning. Or the person who has one glass of wine each night. Or who eats [insert treat here]. We just don’t know what is going on in someone else’s life. We’re in no position to judge anyone else. It shouldn’t matter if that cup of coffee was hastily grabbed at the airport or an every day thing. It’s your life and it’s your choice to make. It’s your money to spend. You know your own value; unless someone else is paying your bills and walking in your shoes, they should keep their value judgements to themselves, before you start pointing out * their* coping mechanisms. I am sitting here making my lists of deals for the week. Meijer $10/50? NIce! Stack that for the bleach deal and dog food with my coupons. Kroger $6/30? Yes, there’s my meats for the week. Giant Eagle double coupons.. those snack foods are taken care of. My Jeep needs gas, so my .80/gal fuel perks will help cover that. I’m in desperate need of some summer clothes. Yay! A garage sale got me three pair of capris, a top, and a black maxi dress for $22. I do all this as I sip from my $5.50 venti triple shot white mocha latte from Starbucks. Why would I “waste” so much money on one cup of coffee? Because I wanted it. I work hard to save money at every turn specifically so I can afford to indulge OCCASIONALLY. I can afford a nice coffee when I’m really feeling stressed. I CAN take hubby out for a nice dinner and a movie. I have that luxury, since I save on every aspect. I do not feel guilty. Nor should anyone. I totally agree with you. If we didn’t shop frugally we would be scraping to make ends meet all the time. Being frugal gives us margin to enjoy the sweet things in life. Uhmm I am sorry this lady so mad at you. Yes Starbucks is crazy on their prices but when I buy it I embrace the moment. I don’t stop everyday but when I do I don’t fell bad. You were enjoying the moment. Thanks for your great ideas. If you budget for a treat–ENJOY it. That’s the point of a budget and of a “treat.” You’ve earned the coffee. Being frugal and being cheap are two different things. Buying a cup of coffee when you can’t feed your kids is stupid. Being a successful writer, traveling to a speaking engagement, coffee is just, well, coffee! I read an article recently (and it changed my perspective) on what makes people happy. On the list, was the little daily things…..it could be a bagel or a hot chocolate or whatever it is that is something small, but adds to our daily joy. I know those things add up in cost, but for me the simple pleasures in life outweigh the money spent. I’m pretty frugal and if I want to buy a soda or a hot chocolate and it makes me happy, isn’t immoral, etc then I do it. Life is too short not to have those little daily pleasures. Do not see the need to explain or justify any of your actions. Frugality works in the ways YOU choose, not in the areas other people feel it should work. No one else knows all of your circumstances, and it needs to stay that way. this made me laugh out loud! I am a Worst case scenario Person too. I don’t wear s anymore but I have forgotten to take them out plenty of times. I don’t think I ever forgot only one though!! Hope you enjoy your day! Your post made my wait time for an oil change a little fun! Ps..I love Starbucks and will only buy their plain coffee too, but who’s to judge you if you did want to buy Starbucks every day? To each her own! It’s so easy to yell hypocrite instead of actually getting to know someone isn’t it? That’s such an epic lesson to pass on. Thanks for the good post. The first thing that came to mind when I saw this post was I bet she used a gift card she earned from surveys etc. I agree that you don’t have to explain yourself. The best thing about trying to be frugal and finding creative ways to save and earn extra money is knowing that you can have expensive things and sometimes it does not cost hardly anything! I love your blog and read it all the time. I’ve done the one in one out myself! LOL! This is a great point aboit perspective. I don’t understand why so many people feel the need to criticize right away especially when they do not have all of the facts. Living a frugal life is commendable; however, that does not negate the fact that everyone….everyone is entitled to a spurge now and again. For all the you give back, you certainly deserve a Starbucks coffee now and again. Everyone is entitled to fill their soul, body, & mind so that they can give of themselves to others. So yes, get that coffee, enjoy every sip, and never let anyone make you feel bad for the choices you make in your life. Please, can’t we stop tearing other women down & just build each other up? Isn’t life difficult enough? Before she responded maybe she should have asked herself “Why was this cup of coffee so important to December212012.” For example: I just dropped my husband off at the Airport for another deployment. While I cried my eyes out I sat in the corner to have a small cup of coffee. The only thing that was going to give me some normalcy that day. Sometimes the simplest things in life don’t need to responded too. This was me two weeks ago in the Orlando Airport. I try to live fairly frugal for the most part. My one treat is Starbucks. I am not so frugal at Starbucks, and I have no problem with it because I earned the money used to buy it, and I can afford it because I am frugal in all the other areas of my life. We all have something we like to splurge on. Buying Starbucks can be a part of a money saving budget. If we watch our expenses, we have the ability to prioritize our purchases and treat ourselves. As a single mom, I splurged on bath and body works hand soap. It was expensive but made me happy every time I washed my hands. My happiness rate of return far exceeded the cost. Keep up the good work. I love your blog. FYI -I once left a in too and ended up going to the eye doctor to get my vision checked due to blurriness. Luckily, I discovered I had been wearing two s and removed the evidence while waiting for the doctor to come in. So know you are not alone. ? You know… I don’t think being frugal is about spending every waking moment worrying about whether or not we’re pinched every single penny we own until it bleeds. No more than a site on minimalism is about getting rid of absolutely everything you own. I follow a site about minimalism. I don’t expect to see the rooms bare on that site. I expect words of wisdom about areas where I can make life simpler and improve my quality of life. A site about saving money should help me explore areas where I can save money…not so that I can never enjoy that occasional splurge but that I can do that, knowing I’m not breaking the bank by doing so. I wouldn’t care if you had paid full cash…and bought the most expensive coffee in the house. The money saving aspect there is that we don’t do that every day…a change in the heart of our stewardship. I so wish we would all stop judging one another. Every single day you give advice on areas where we can save money. Why? So we can hoard it? It isn’t about she who saves the most money by the time she dies wins! It’s about being a good steward of all that God gives so that we have more to share…and even giving ourselves that occasional gift of a little luxury. Sad that this woman opted to throw away all your helpful advice over one cup of coffee. Speaks volumes about where her heart is. Keep tossing your helpful advice our way. We’ll apply them where it best suits us and our needs. And thank you for this reminder about judging others. Our pastor often says that we should never judge anyone because we have NO idea what they’ve gone through to just get where they are now. I know that’s true in my own life. God bless you as you bless us!!! We don’t do Starbucks often, but occasionally my hubby & I will go as a date. We get gift cards from our grocery store & save money on gas. Plus, we have received many as gifts. It goes with the old sayings, “Don’t judge a book by its cover,” & “don’t sweat the small stuff.” Enjoy your coffee however you like it!